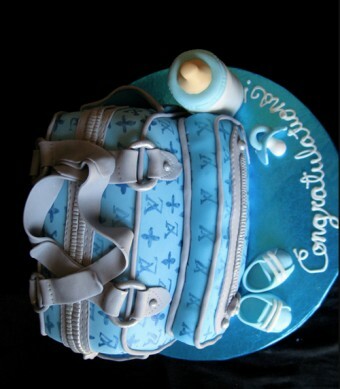 Awesome Diaper Bag Cakes for Boys!
. Published on August 21, 2012 . 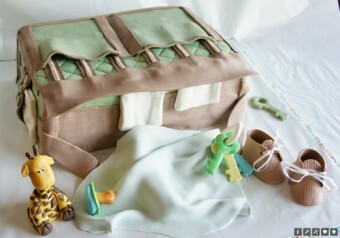 I get a lot of requests for this diaper bag cake for a little boy. 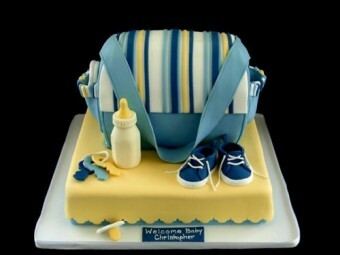 The diaper bag cake is extremely popular and one of those cakes that can be customized to any type of bag. 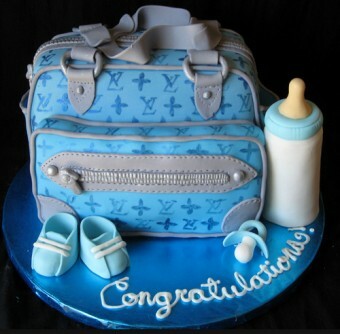 This one was a Louis Vuitton themed bag as requested by the mommy to be. I hand painted the pattern with some food coloring and a steady hand. 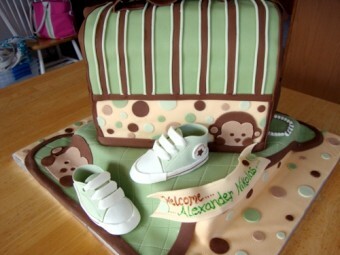 Some accessories you can include in your diaper bag cake are items like a pacifier, baby bottle, booties, toys, bib, baby wipes, stuffed animals or even baby blocks. I made all the accessories out of gumpaste which is like fondant but it dries very hard and is much more firm than fondant. You don’t have to go with a name brand as the theme. 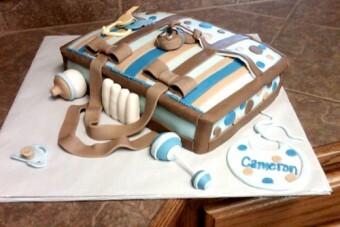 Look at different styles of bags and accessories to get an idea of the type of bag you want to turn into a cake. Keep in mind this has to be made of cake, so you want to choose a shape that will be easy to carve from cake. You can use other colors besides blue for a boy themed baby shower. You don’t have to do boring old blue. Try other fun colors like green, brown, yellow or even silver! Don’t be afraid to go out of the box. Instead of going with a specific color theme like blue, why not choose a theme like jungle or western for the cake? Think about how you want to decorate your babies room and run that theme throughout all the events like the shower and the cake. 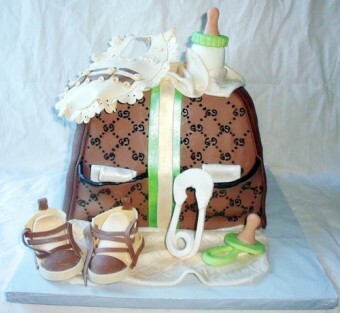 If you really want a different type of diaper bag cake, why not go realistic! 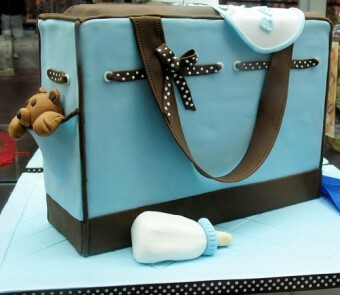 Freak your guests out when you cut into a super realistic diaper bag cake that they won’t believe is edible! Cakes like these are made with painstakingly detailed brush work or edible images. Yep that is a CAKE. No one does realism like Debbie does. Even when you look really REALLY close, it’s still hard to tell if this is a cake or the real deal. Even the texture on that diaper is like EXACT. 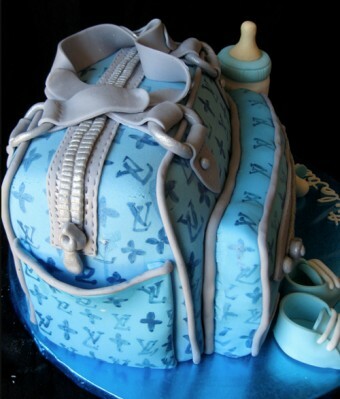 It’s those kinds of details that make this the diaper bag cake of all diaper bag cakes and you’d be hard pressed to find one better. 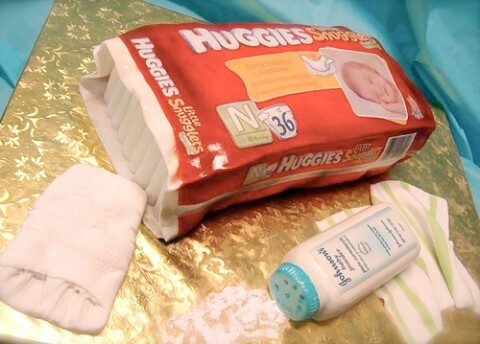 If you are thinking of making your own diaper bag cake, there are lots of tutorials but the concepts are basically the same. You usually only need one sheet cake, some buttercream, and some fondant. You will also need a good reference photo of a diaper bag that you want to re-create. Think about the accessories you want to add to your cake and make those ahead of time so they have time to dry (like the bottle, shoes, booties and teddy bear). Step 1. Bake one 1/2 sheet cake (18″x26″) of your favorite flavor of cake. Firm cake works best. Allow cake to fully cool, wrap in plastic wrap and then let rest overnight and it will be easier to carve. Step 3. Cover your cake board with cake foil to protect it from the buttercream’s oils soaking through. Make your board big enough to hold your cake and all the accessories. Step 4. Cut your cake into 3 equal pieces, about 8.5″ each. Place the first layer on the board, cover with buttercream, repeat with second and third layers. Step 5. Carve down the edges of the cake to mimic the shape of the bag you want to create. Once the cake is carved, cover the cake in a THIN layer of icing. This is called the crumb coat and locks in the cakes crumbs so you can apply a clean layer of buttercream once it is set up. Place the cake in the fridge for several hours until the butter is firm. This will make applying the second layer of buttercream easier. Step 6. 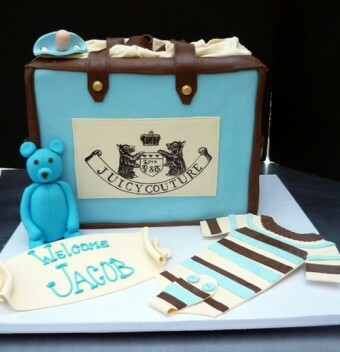 Create accessories like booties, pacifiers, bibs or teddy bears that are proportionate in size to your cake. Step 7. Cover your cake in a second layer of buttercream and smooth down with a spatula. Place back in the fridge to firm up again so you can apply the fondant. Step 8. Cover the carved cake in fondant. Trim away access with a sharp knife or pizza cutter. 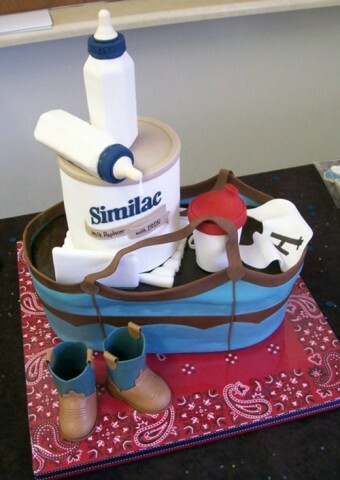 Apply details like pockets, handles, zippers, buttons or patterns with fondant. You can even hand paint patterns with food coloring. A stitch wheel is invaluable for creating realistic stitches along seams to get that “bag” look.